The S&P 500 has been flashing a number of technical signals to the market over the month of August. Amongst the various signal we had an inverse head and shoulders and an ascending wedge giving investors bullish and bearish signals. August 11th provided a resolution with the ascending wedge breaking down and the market moving significantly lower. More troublesome was the market’s action the next three trading days. After large moves in one direction the market typically consolidates in the opposite direction as short term traders look to book profits and others buy on dips/sell into strength. What we had was the opposite, a market that could not move higher and instead drifted lower. On August 12th, a Hindenburg Omen signal was triggered. A Hindenburg Omen is a statistical sign made up of market indicators which foreshadows a move to the downside. Just one Hindenburg Omen is not enough as there needs to be confirmation of the first signal within 36 days. If this signal is not confirmed then the signal is not valid. The Hindenburg Omen has 5 criteria which must be met. 1. The NYSE 10 Week moving average is rising. 2. The McClellan Oscillator is negative on that same day. 3. The new 52 Week Highs cannot be more than twice the new 52 Week Lows (however it is fine for 52 Week Lows to be more than double new 52 Week Highs.) This is a mandatory condition. 5. The smaller of the two numbers being greater than or equal to 69. Delving into these criteria what we find is an indicator which attempts to signal the possible occurrence of a fat tail event. First, we have a rising NYSE 10 Week moving average which suggests a market trending upward followed up by a fair portion of stocks making new highs. But underneath the surface there is trouble. The McClellan Oscillator, used by traders to gauge market breadth, is negative signaling that more stocks are falling than rising. This is a sign that a correction may be approaching. Next we have the 52 Week Highs and Lows. 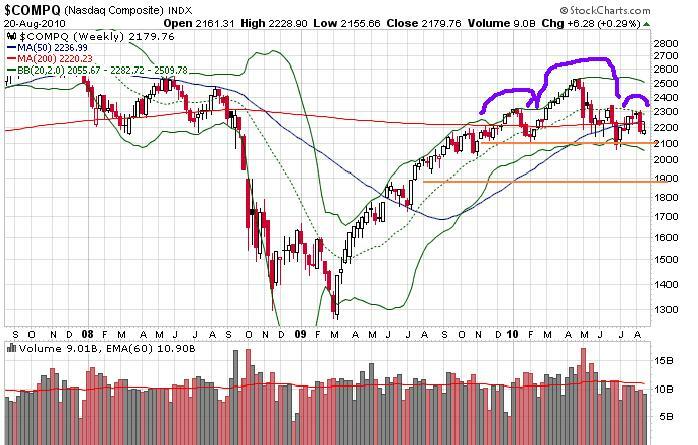 In an rising market one would expect significantly more new 52 Week Highs than new 52 Week Lows. But here the number of new 52 Week Lows are close to the number of 52 Week Highs, relatively speaking. The number of 52 Week Lows are also more than 2.2% of the total NYSE issues traded that day. 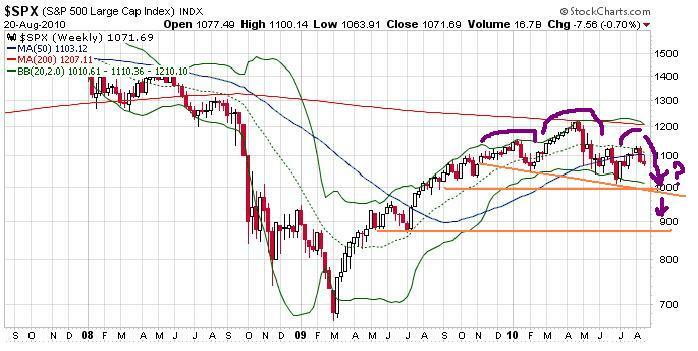 This sends a signal that the 52 Week Lows tail is getting fatter, a sign of underlying weakness. What we find is that while the market appears calm, there is significant turmoil and weakness underneath the surface. 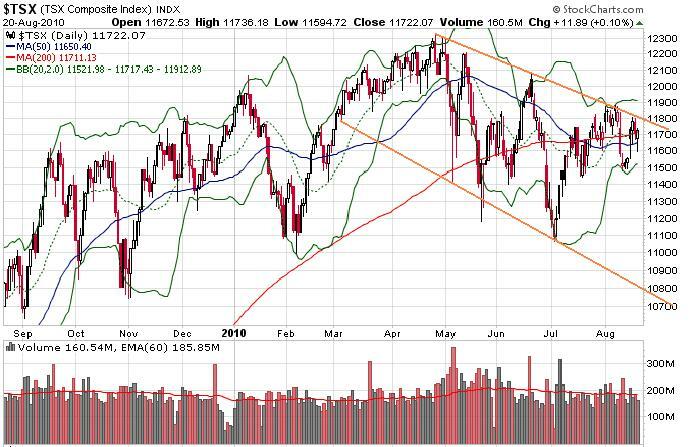 While a Hindenburg Omen does not mean the market will crash it is a signal that a fat tail event may be approaching in terms of a market pullback. Thursday and Friday of last week provided a confirmation of the original signal. According to the Hindenburg Omen there should be a move to the downside in the next 40 days. This does not mean there will be a crash. The downside move could only be as small as 5.5% for the signal to be accurate. It is not my belief that we are heading for a second stock market crash but investors should tighten stops on long positions and/or hedge long positions until the danger passes. The underlying market weakness following the markets drop on August 11th combined with weak economic reports should give investors pause. The inability of the market to move higher indicates a lack of buyers as investors seem to be waiting on the sidelines. Now there is good news to report. This drop, should it occur, would put in a major low for the four year Presidential cycle leading to a solid rally into 2011. In other words, protect your long positions and get your cash ready to allocate so you can buy at the bottom. After seeing quite a large rally from the March lows the market appears to be extended and indicators (stocks above 200 day moving average, market PE, bullish/bearish %’s) are signaling some rough seas ahead. While stock could conceivably move higher there are a few reasons why I am bearish at the present time. Harkening back to 2007, I would like to give credit and thanks to Credit Suisse for the following graph. As one can see the initial tsunami of bad loans has receded and financial stocks have been licking their wounds and repairing their balance sheets but we are at the beginning of the second wave. 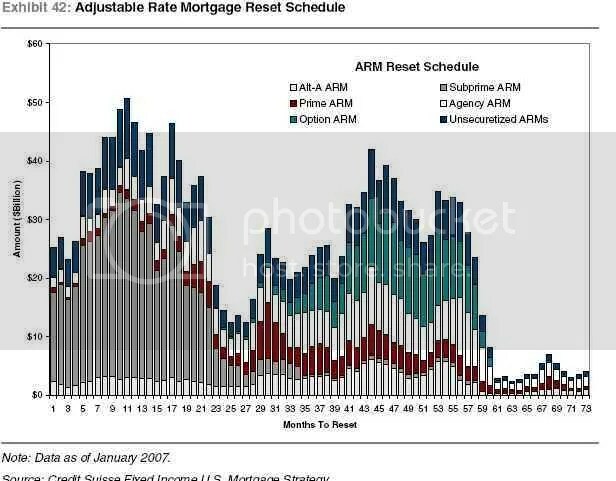 This second wave of option reset mortgages will do more damage because of the already weakened state of banks. The relaxing of mark to market rules has helped repair balance sheets but there will continue to be problems throughout 2010 and into 2011 until the 2nd wave of resets recede. As the resets continue, non-performing loans continue to rise, causing additional strain on an already weakened banking sector. It is unlikely that we will see a significant drop off in non-performing loans until the bulk of the option resets are completed. Bank failures continue on a weekly basis with the problems being felt mainly by small and medium sized institutions. Some larger weakened institutions have succumbed to the pressure as well. Recent comments that the FDIC may need additional capital should sound a warning bell across the financial space. While the housing data has been bullish due to buyers assistance programs, one needs to keep in mind that the reported figures are month-over-month data, not year-over-year. As we get into the fall and winter months the MoM figures will decrease as seasonal patterns take place. Housing inventories continue at a high level, with many homes being taken off market and rented until the selling climate improves. As we continue through the resets, it is likely that inventories stay high until the potential overhang from option and agency ARM’s clears. Any spurt in new home construction will slow the housing inventories from being worked off in a timely manner. Retail sales numbers continue to be disappointing, although we are entering a period where comparisons will be much easier. The year over year data shows a 9.4% decline in June and an 8.3% decline in July. Again the YoY data is more telling than the MoM data. High levels of unemployment will constrain spending and GDP growth into 2010 and later. Government stimulus programs will provide the necessary counterbalance to weakness in consumer spending helping to guide the economy through this difficult period. This is not an approval for the governments polices but one needs to note that a similar path is followed in every recession. The authors problem lies in the wasteful programs and high deficit levels that state and federal governments carried coming into the recession which only exacerbates the problem going forward. Spending that is targeted at areas to provide future growth is preferred over the construction of dog parks. So while global economies are likely to come out of the recession without much problem (Japan will be an exception) GDP growth in the US is likely to be below normal levels. Inventory restocking will give a bump to GDP growth in the coming quarter as will government stimulus programs. This combination will set the stage for renewed consumer and business confidence in the coming years but first we will need to get through the a possible double dip recession in 2010. So while the market itself may move higher I see better value and higher upsides in the precious metals and agriculture sectors where there are some very interesting values globally. Quite often the best values are off the beaten path.